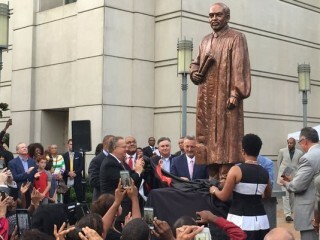 An 8-foot-tall bronze statue of former Tennessee Supreme Court Chief Justice Adolpho A. Birch Jr. was unveiled Saturday in a ceremony honoring the judicial pioneer's legacy. The unveiling also marked the 10-year anniversary of Nashville's downtown criminal courthouse, which bears Birch's name. The larger-than-life statue, created by New Jersey artist Brian Hanlon and paid for by donations, sits on a base at the courthouse's main entrance on Second Avenue. "It's quite fitting, too, because Justice Birch was, and is, a larger-than-life judicial trailblazer, and now we can all see and say that literally," said Presiding General Sessions Judge Rachel Bell, who led the committee to get the statue in place. Bell said she grew up three houses down from Birch and grew to admire the man. Birch was the first African-American prosecutor in Davidson County, and the county's first black judge in both General Sessions and trial courts. He later became the second black justice on the state Supreme Court, and the first to serve as chief justice. "He believed that through the practice of law, the most noble of professions, in a city that was the epicenter of social change at the time, he could improve the human condition," said Birch's son, Adolpho Birch III, a Vanderbilt University Law School graduate and lawyer for the National Football League. "He could impart civility, he could impart humanity. He could hold us to our highest ideals. Justice. Equality. Compassion for all citizens. I do not speak for him lightly. "He would hope, no, he would demand, that this statue be viewed not as a recognition of his accomplishments, but as a source of inspiration for others to carry forward the dream he held dear." Birch announced his retirement in 2006, the same year the then-new courthouse was dedicated in his name. He died of cancer in 2011. Mayor Megan Barry said during remarks at the ceremony that she was proud to see the statue in place. "The things that he stood for that meant the most to me are justice, fairness, equal access under the law, honor and most importantly, reaching back to pull younger people along to help them make their way in the legal profession," she said. "Justice Birch had an incredible impact on our city and our state at every level of the judiciary."